Distributor: Currently available streaming on Daisuki. Notes: Based on short stories by Tokumi Yuiko. Hororo, Chihiri, Kururu, and Sarara are four magical fairies that have been seen from the fairy world down to earth to understand the life of a human being and eventually become human themselves. Currently, they live in jars that sit on top of a desk that belongs to a high school/college student known by the name "Sensei", who (is to supposed to) teach the fairies about how humans live. The four magical fairies are (mis)guided by Tama on their journeys to not only understand humans, but to become human as well. Will they ever learn enough for the fairy world to grant their solemn wish? And I thought anime like Pokemon were formulaic, one-dimensional shows. Bottle Fairy takes the cake in that category. Shows such as Doraemon and Sazae-san are acceptable for all ages in Japan, but are watched by people of all ages all across Japan. Bottle Fairy may be a harmless show like Doraemon, but I can not see any person above the age of five enjoying this show. Even then, the slow pace of the series will turn off a lot of those kids who can divert their short attention spans toward Pokemon. None of the characters are described at all. Everyone is one-dimensional. 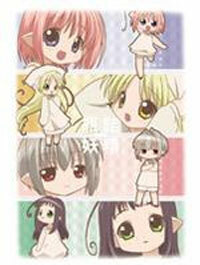 The four miniature fairies: Hororo, Chihiri, Kururu, and Sarara all have the same exact personality. They're really, really, really cute fairies that do really, really, really cute things. That's pretty much all they do. The one called "Sensei" is not much of a teacher at all. He has about two lines of dialogue to speak per episode that are completely and utterly meaningless to the plot. Though I can give him some credit. During the last two episodes, he actually says lines that are not, "I'm leaving" or "I'm home" or something similar to that. Tama gets more lines to speak, but more dialogue doesn't mean more personality. Her job is to (mis)guide the fairies on their quest to become human in each episode. She doesn't intentionally misguide them. She's just a clueless grade school kid who has nothing to do but to talk to pint-sized fairies every episode. Normally the episodes center around a particular holiday or date in which they learn about certain Japanese customs and traditions that humans are very used to. They are led by Tama to learn about all these things: most of the time. Sometimes they don't even learn about humans in the series. Practically an entire episode was dedicated to having all four cutesy fairies presenting random poetry that has the sole purpose of rotting the teeth of its viewers with large doses of "cute". Even the music reeks of "cute". It's sung by the fairies in cutesy voices with cutesy music playing in the background while the cute fairies do cute things that make you say "Aww ... how cute". The ending theme pretty much follows suit with the whole cuteness thing. The artwork and animation are rather simple looking. Very light and pale colors are the theme in this anime. Nothing moves at a very fast frame rate and there are some repetitive frames here and there if you look close enough. The character designs of the fairies are cute while the other couple of characters are your generic adolescent folks. Nothing special to see there. I like cuteness in my anime, just not when it's shoved down my throat in large doses by a bunch of magical fairies. Recommended Audience: Nothing objectionable. Not that it matters because no one will watch it. This is too stupid for anyone above the age of 5 and anyone below that age doesn't have the attention span to stick to watching the show on a regular basis.